Not every trip goes as planned, so it is best to research before you make any reservations. If you are considering the Wyndham Grand Desert in Las Vegas, the first step is to check out the website, but every resort website will show you the splendor and magnificence of their hotels. What you really want is an inside look, and an opportunity to compare the hotel with others before you book a room. The city of Vegas is huge with its array of activities and sites. But we know not everyone goes to Vegas for the same reason. You may bring the family which includes children and being surrounded by loud music, and the wild nightlife may not be suitable for you. Instead, you want to relax poolside or take in a family-friendly show. This is where you may start beginning your research into the Wyndham Grand Desert Resort, and this article will provide what you seek. On the other hand, great bands, club dancing, and bustling casinos might be exactly what you crave. Also, plenty of couples go to Vegas for a once in a lifetime honeymoon weekend or even to tie the knot, at one of its many chapels. Perhaps it is elegance and romance and privacy you seek at the Wyndham Grand Desert. We looked at the Wyndham Grand Desert Hotel and reviewed the rooms, location, amenities, and prices and compared them to other popular Las Vegas hotels. Reading our findings will better assist you in making that important decision. What is the Wyndham Grand Desert? What many people do not know is that Las Vegas is more than a city of lights shows and casinos. Las Vegas is a desert with unique wildlife, landscape, and even mountains. The Wyndham Grand Desert resort is perfect for families who want to enjoy relaxing, quality time together. There are no casinos on this site making it a quiet getaway. Instead, the Wyndham Grand Desert offers a game room and activity center for fun family time. And who doesn't like to sit by the pool? The large outdoor pool provides plenty of space to float and swim. After a day of sunning and splashing, you can head back to your spacious room and whip up a snack in your full-size kitchen. If you are bringing the kids but are seeking privacy, some suites offer a spa in the master bedroom. This will help you unwind because as much as we love our family, we also need serenity. Wyndham Grand Desert is on the edge of one of the most famous strips in the world. And you won't want to miss it. The hotel provides free shuttle service plus a full-service concierge to help you plan your visit. Las Vegas is so much more than casinos and shows, but some of the best sports teams play in the city. The concierge service will make sure you have the best seats to the hottest games. And if golf is your game, there are at four golf courses within five miles of the resort. 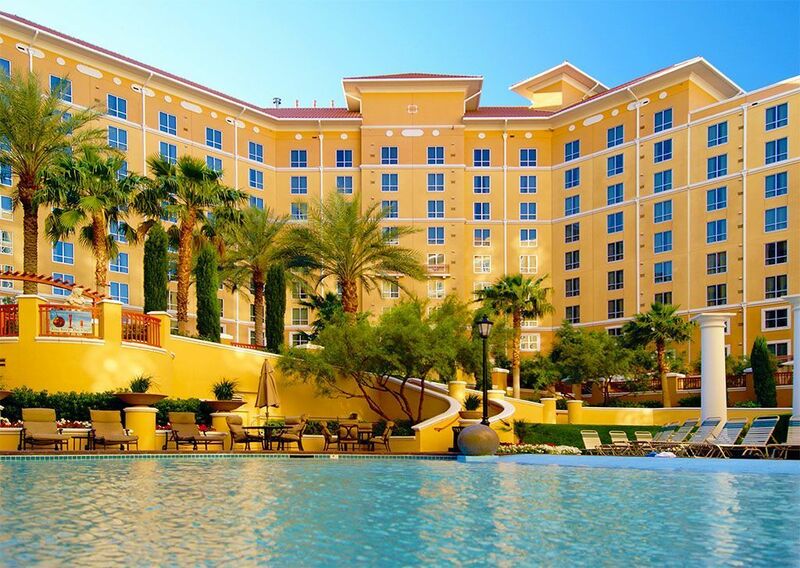 If you are looking for the perfect spot to host a business trip, the Wyndham Grand Desert maybe it. With meeting rooms, they will treat all your clients and guests with excellence and professionalism. In between meetings, the lush courtyard garden offers a place to gather and rejuvenate. When the long day of conferences is over. Your associates have the option to relax at the pool, or one of the 4 outdoor hot tubs. Some of your guests will want to hit the on-site gym or head over into town for the best in dining and entertainment. Everyone will be satisfied at the Wyndham Grand Desert. You can book a one bedroom or two bedrooms at the Wyndham Grand Desert for around $150.00 -$250.00 per night. This lush resort is just minutes from McCarran International Airport (3 mi), Las Vegas Convention Center (4 mi) and UNLV (1 mi). 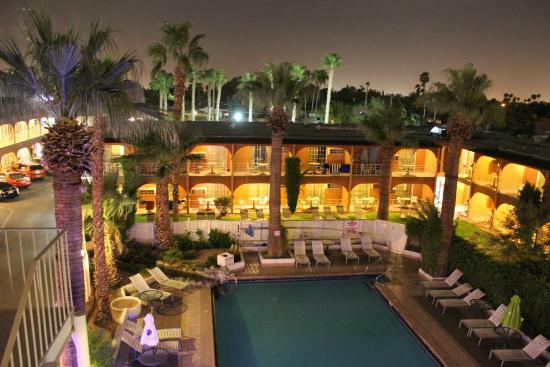 Wyndham Grand Desert is the perfect location for a relaxing vacation or conducting business. The Wyndham Grand Desert Hotel is upscale and beautiful. The pool and outdoor gardens are created to give you a tropical oasis experience. We picked three other well-known hotels in Las Vegas to see how they compare. The Flamingo Las Vegas hotel is an all-in-one casino and entertainment center. It blends old style Vegas with updated amenities and guest rooms. The 28 floors of rooms and suites give visitors many options. If you are looking for something small and low key, you can get a standard king size bedroom. If you are looking for a high roller place to party and rest, the Flamingo Las Vegas Hotel will not disappoint. Everything the traveler needs is right here in this historical resort. Business and meeting rooms are available for the professional. The work out enthusiasts will be happy with the fitness center. The outside grounds are just as pleasing. They engulf the pool in a wildlife habitat that will make you forget you are in a city. The hotel even hosts a 15-acre water playground. 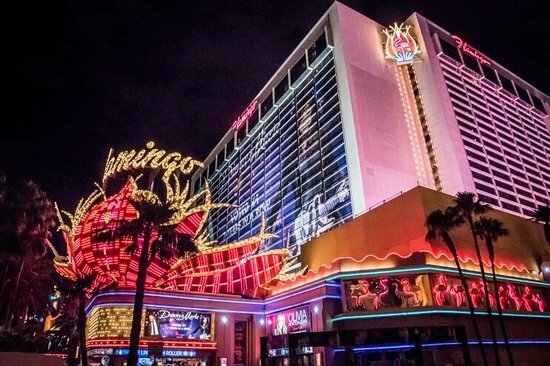 You can feel comfortable bringing the kids to the Flamingo for fun, relaxation and family-friendly shows The Flamingo currently has The Donny and Marie Osmond Show on their calendar which entertains the young and old. If you are looking for an elegant outside chapel, the Flamingo will provide you with one big enough to invite all your friends too. The on-site casinos offer plenty of tables and slots, so you never have to leave the resort. The Flamingo's dining options will please any picky eater from fast bites to upscale elegance and many choices in between. If buffets are your thing, you won't want to miss the Paradise Garden Buffet. The price is moderate, but the ambiance is not as you dine with breathtaking views of waterfalls and tropical landscapes. And be sure to grab a few of the abundant supply of desserts before you leave. You can book rooms for as low as $50.00 a night. Suites run between $150.00 and $200.00 per night. The Flamingo is in the heart of Las Vegas. You are steps away from the best shopping, dining and casinos Vegas has to offer. Although the Flamingo has much to offer everything is extra including the use of the fitness center. We love the blend of old Vegas with new. The Flamingo offers family-friendly style and modern day luxury. Paris is known for romance. 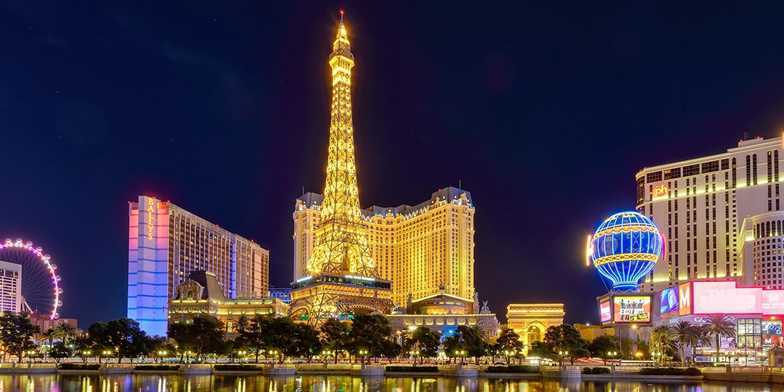 You want the experience of luxury rooms, French cuisine, and breathtaking views but Paris is out of your reach then take a trip to Vegas and stay at the Paris Las Vegas. This hotel combines sensuous elegance with lavish casinos, and eye-dazzling shows, The Versailles-style fixtures, and upscale decor are unlike any other hotel in Vegas. All the rooms at the Paris Las Vegas are spacious and comfortable. If you want to impress the lady on a romantic getaway, then you should reserve a suite with an oversized bathtubs and a grand chandeliers. The suites are rich in Paris culture and sophistication. You may not want to leave the room, but we suggest you do to enjoy the variety of meals served at the 15 restaurants and bars. Not everything is French so no need to worry. If you are looking for a big fat juicy burger or thick Angus steak, The Beer Park serves an All American cuisine, and the Gordon Ramsey Steakhouse offers mouth-watering cuts of beef, you will go home talking about. But there is more. Enjoy Italian dishes and even oriental plates that will dazzle your palate. No one can complain that there was nothing to eat. The nightly entertainment is top quality as well. You have comedy, hypnotists and for the lovers, some R rated shows. Paris is romantic, but it is also seductive. On the Blvd for high city action. The Paris Las Vegas hotel offers a spa service that will transport you to the magical city of Paris. Enjoy a hot stone massage and aromatherapy in one of their 24 serene rooms. Enjoy a unique cocktail at the poolside bar next to the Eiffel tower replica. The Eiffel Tower Experience is considered one of the best attractions in Las Vegas. It will be the highlight of your romantic evening as you stand high above the awe-inspiring, 360-degree view of the city. If you love the Pair culture and its architecture, you will love this place. This one is low key and comfortable. No fancy lobbies or fine dining but you get what you pay for, and the price is right for anyone just looking for a clean room, good service and quiet rest. The Shalimar caters more to the economy traveler who wants to experience the glamor and excitement of Las Vegas but isn't looking for a crowded, high priced resort. There is enough here to please anyone who wants simplicity. The pool is small but suitable for a quick dip to cool off, and the bakery and coffee shop is perfect for a hot mocha and pastry. If you want a full meal, the bar and grill serve great Cuban sandwiches and specialties. The rooms are a moderate size but recently remodeled, giving them a fresh, clean look and feel. Some guest rooms have balconies overlooking the pool with enough room for a table and chairs. This makes for a pleasant and quiet evening for the tired traveler or couple looking to get away from the noisy city lights. Shalimar's best feature is its location; It is near the Convention Center in the Historic District on Las Vegas Boulevard between the World Renown Las Vegas Strip and the Downtown Fremont Street Experience. This part of the city has areas that others might deem as unpleasant, but that is because they do not know about the hidden, secrets this area presents. The Fremont Street Experience offers free live music and light shows. There are little tidbits of Vegas's history along these streets with some of the best smaller casinos and restaurants. You can book a room for as low as $100 per night. In between old Vegas and new Vegas. The Florida Grill has fun entertainment and a charming atmosphere, but besides the restaurant, there is nothing else on site. Clean and Comfortable with friendly service. The Wyndham Grand Desert is a thumbs up for us. We love the location. It lies just outside the hustle and bustle of the Las Vegas Strip giving guests the options to have a dramatic evening in the city or a quiet stay in the hotel's spacious suites. The full-size kitchen allows guests to cook their favorite meal. Enjoy your home baked dinner as you sit back with a great movie on the large screen TVs. The kids can hop down to the main area and spend family time shooting billiards or playing video games. The pool and outside grounds are spacious enough to give you peace and serenity. You can sit under the desert sky, to take a nap or read a book. Without all the noise of daytime partyers. The location price and amenities are not 5-star elegance with action-packed casinos and upscale decor, but it is enough to give it a 4-star rating.